Question: We are removing old cheap “peel and stick floor tiles” with an industrial heat gun, razor blade bars, and pry bars. It’s takes a lot of time but the tiles are coming off fairly easily. My problem is that the adhesive from the old floor tiles is sticking onto the wood floor underneath. It is an enormous mess and anything that sticks to it does not want to come off. We can’t walk on it without our shoes almost being pulled off. 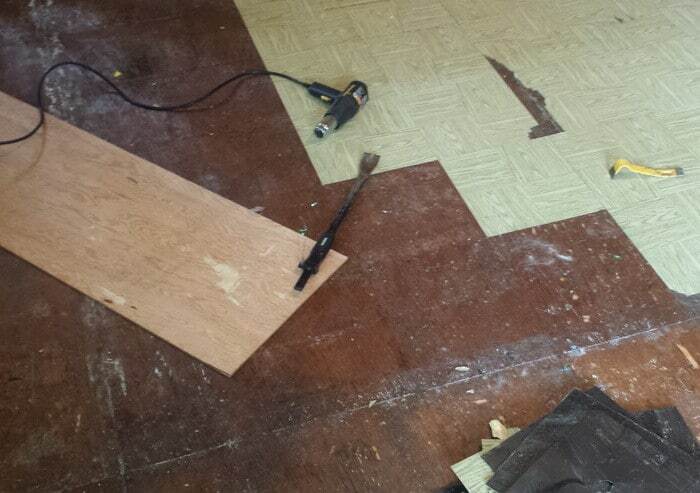 We are using a piece of plywood to sit on as we remove the floor tiles. This is an old bedroom we are renovating and we will be putting down carpet. 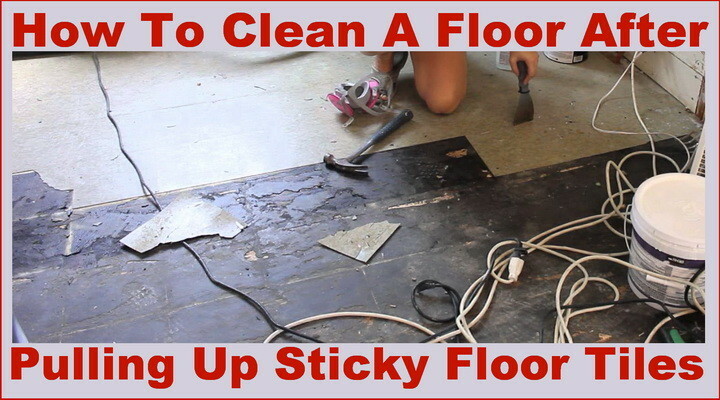 Is there a trick to getting rid of the sticky goo from the old floor tiles? WARNING: Do not use a sander on the tiles as they may contain asbestos. Also be careful when prying up the tile, if it is weak and brittle the cracking and breaking of the tile can release asbestos fibers. Answer: Old peel and stick flooring tiles that have been down for many years will always cause the issue you are having. The only true solution to removing all of the sticky residue and goo is a by using a contact adhesive remover. You could also use acetone. This will work probably the best but is highly flammable and has very heavy fumes. Not recommended but if nothing else works you may need to use it. Ventilate your home and wear masks if you choose to go this route. Another option is to screw a plywood sub-floor over the remnants of the sticky adhesive and then lay the new carpet over that. 1. Pull up linoleum, tiles or paneling. 2. Wear chemical resistant gloves, chemical splash goggles and appropriate work shoes. Shake well before opening can. 3. Pour remover onto the adhesive to be stripped. Spread with a long-handled paint roller to obtain a thick even layer at least 1/16” thick. Do not step on the area, as it may be slippery. Leave the area and let the remover do the work. 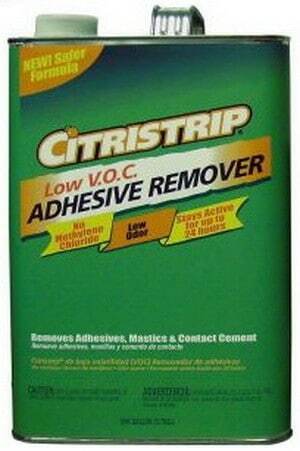 Do not allow the remover to completely dry on the surface as the adhesive can re-adhere. 4. After 1-3 hours, scrape a small test area to see if the adhesive is softened and ready for removal. If so, use a long-handled sidewalk scraper or floor hoe to scrape the loosened adhesive. Any remover that is still liquid can be pushed onto another area and reused. If the remover and adhesive form a thick gel or solid material, use a broom and dustpan to pick up the material and take it outside to fully dry. Before the scraped area is completely dry, use a mop with soapy water to get up any residue after scraping. Do you have a better more efficient approach to removing floor tile and the adhesive underneath it? Please leave a comment below. Corn starch! Yes, believe it or not, after the instructions for my new flooring said not to remove self stick tile adhesive with a citrus based remover (may hurt my new floor) out of desperation I tried rubbing corn starch on the sticky floor and the stickiness disappeared! I rubbed it on by hand until it was smooth feeling and then used a scraper to get any small bumps out. I swept it up and it is ready to put the new flooring down! I would give it a try before using harsh chemicals. 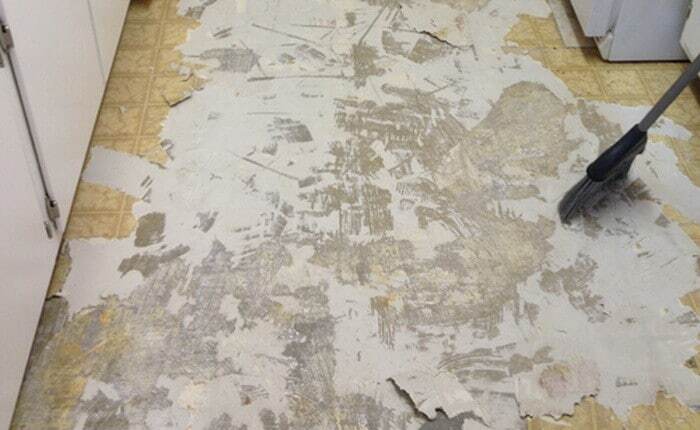 I wanted to remove old self-stick tile from an asbestos tile floor while leaving the asbestos tile undisturbed. After trying a number of products, I finally arrived at “odorless” mineral spirits. The old, sticky residue melted away instantly, leaving an oily sheen behind, but without apparent damage to the underlying tile. I then applied a liberal coating of Simple Green, agitated the surface with a green Scotchbrite sponge pad, and sopped up the dirty mess with paper towels, which I disposed of in sealed metal containers. After it dried, I went over it with full-strength Lysol in a sponge mop. This left behind a clean, matte surface, which I sealed using a commercial floor wax. A bit time-consuming, because I removed small areas of the old sticky tiles at a time, so I could avoid walking on or touching the exposed adhesive. I have today removed old Lino tiles from kitchen, passage and toilet with a towel, an iron and scraper it was very easy and little to no dust. I sprayed water onto them first put the towel on tiles and sat the iron on the towel with the steam going it softened the tile and the glue they came up easy. Wear gloves and respirator. Stacked old tiles into a box for disposal as I went. The glue was amazingly sticky so I could walk on it I squirted a citrus cleaner from Aldi on to the floor throw a little water onto the floor and broomed it around this lessened the stickiness so I could walk and lean on the floor. Work out tomorrow how to removed the remaining gunk. Just sprinkle it on the floor. I used acetone and scraped, still had sticky residue, painted over floor with kilz 2 stain blocker and sealer worked great, put vinyl plank flooring over it a year ago and looks good. Next post: New CFL Light Bulb Not Working In Light Fixture – Dimmer Switch?